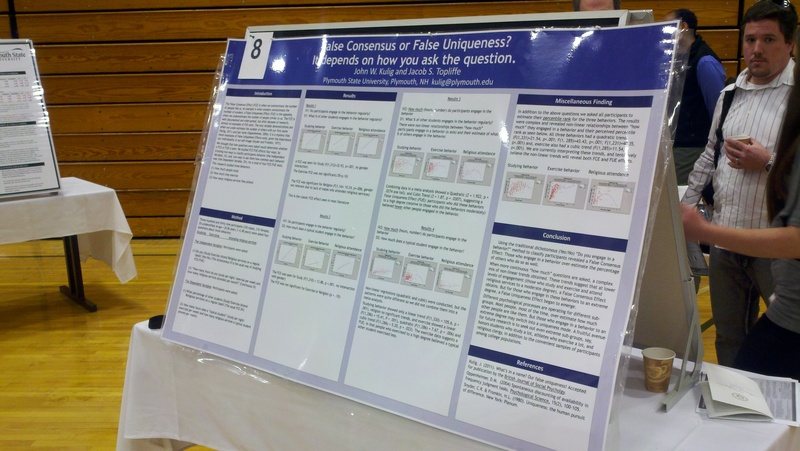 I went to an undergraduate poster session held at Plymouth State University the other day. We had printed about 20 posters for them, and I wanted to see how everything looked. The posters were terrific, and some excellent science was discussed. The real cool thing to me was the presentation board. They used these “tent” style boards on top of a table, and they were terrific. The boards are 36×48″ in size, and allow a poster on each side, so they use space pretty efficiently. When the poster session was over, they fold up, and then in half, and go into a cardboard box that UPS will take. Pretty cool. One suggestion, though. The boards are 36×48″ edge to edge, so a 36×48″ poster runs up and over the aluminum trim around. If we had printed the posters at 34.5×46, they would have been perfect! This entry was posted in Scientific Posters and tagged conference poster, presentation poster, research posters. Bookmark the permalink.